The GPSBOXSPRITE2 precision GPS time video overlay unit is designed to meet the needs of people who require a precision time and date display combined with GPS position. This unit uses the precision one pulse per second (1PPS) timebase from an integrated GPS receiver to drive its display. In addition to the display of time and date, each video field is time stamped with the time in milliseconds since the last second. 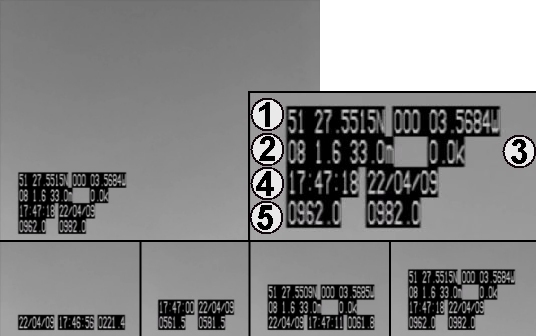 In this way each video field can be easily referenced to the UTC time generated by the GPS receiver. The video time inserter unit is housed in an ABS enclosure with phono connectors for video in / out, a 2.1mm DC power socket and a latching power button. The GPS receiver's RS232 NMEA data is available from a 3.5mm jack socket. A serial cable with a female DB9 connector is supplied to be used to connect the unit to a PC. This allows the output of the integral receiver to be used to be with data logging or satellite navigation software. Please note that the output is non standard 19200 baud, 8N1. The $GPRMC, $GPGGA and $GPVTG data sentences are transmitted. For USB only laptop PCs without a serial port order USBADAPT. 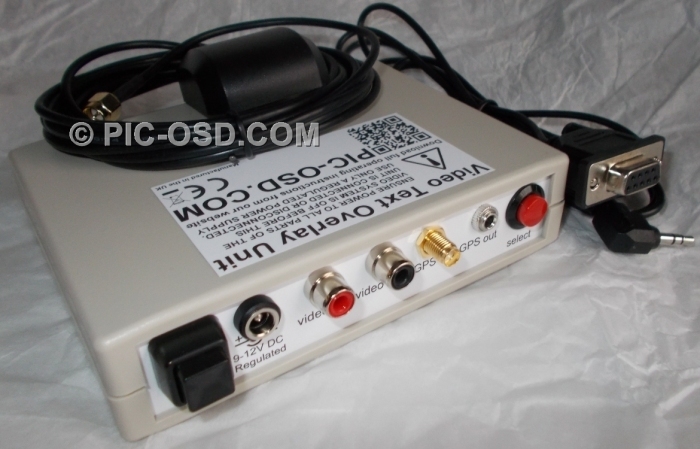 An active GPS antenna with a magnetic base and 2m cable is included with the unit. Please note that the lead time before dispatch of these units is approximately 5 - 10 working days. A camera's composite video signal is composed of a series of frames. Each frame is made up of two fields which are interlaced when displayed. Each field is effectively the exposure snap shot made by the camera. After a field has been exposed it is transmitted as part of the composite video signal. At the start of the transmission of each field the camera generates a vertical synchronisation signal, VSYNC. The precision time video overlay marks each field with the precise UTC time at which this signal occurs. This time is derived from the 1PPS signal and NMEA data provided by the unit's GPS receiver. The bottom line of the time display shows the time in milliseconds since the last 1PPS signal for each of the two fields in the frame. The odd field time is shown on the left, the even field time on the right. The field time display from the time overlay unit is accurate to ±0.1ms over each second. For individual fields the higher field time is the point at which the field began transmission from the camera. The lower field time brackets the interval during which the camera exposure will have taken place. This display allows you to read the UTC time of an event recorded on video from the screen and reference it to any other time base very easily. Please note that not all video recording equipment will allow the display of individual fields in playback. The on screen display can be switched betwen 1, 2, 3 or 4 lines of data under the control of the unit's select button. The date types which can be displayed are shown in the table above. The character background can be toggled on and off. You cannot display any other combination of lines, change on which line each data type is displayed or change the position of the display on the screen. The character size cannot be changed. Once set, the user options remain stored in the unit until they are changed again. The unit has no other user controls. The 1PPS signal from the GPS receiver is accurate to within 1 us as long as the receiver has reported a valid and accurate fix for at least the previous 4 seconds. Under these conditions the time displayed is accurate to ±0.1 milliseconds. Although the receiver will continue to output the 1PPS signal when its position fix is lost, there is no specification of its performance when there is no position fix. Due to changes in satellite configuration and signal reception all GPS receivers can produce invalid NMEA data or in some cases fail to provide a 1PPS. In such cases the time displayed by the precision time overlay unit display will be incorrect for as long as this error condition continues. Generally such errors cause the time display to halt and so can easily be identified in any timing recording. Therefore any application must include an examination of the recorded timings immediately prior to an event to ensure the event time is valid. The millisecond count over each second allows the 1PPS second duration to be verified at the same time as the frame / field interval of the video signal allows the millisecond count to be verified when any recording is reviewed. The precision time overlay is not suitable if you need to simply read the time off the screen rather than reviewing a recording. Please ensure you are aware of the limitations of the GPS system before ordering. *By default the unit will be supplied compatible with the video standard of the country from which you make your order. If you live in a PAL country and require an NTSC compatible unit, or vice versa, then email and tell us this at the time you make your order.